Today I attended the Young Children and the Arts Conference at Molloy College in Long Island. The presentations on how arts help benefit children’s emotional and social development was inspiring and exciting to listen to. I love learning. Arts help with cognitive, kinesthetic, and aesthetic development. The arts and music help develop memory, self-regulation, processing, attention and representational competence. 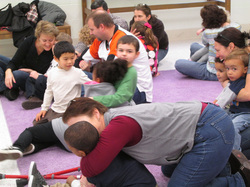 It can also help kids learn to enjoy interacting with people and with their parents and family members. Suzanne Sorel from The Rebecca Center at Molloy College, a Music Therapy center, showed a video of her working with a little girl and doing music therapy. It was wonderful. I love music therapy. The Rebecca Center is an amazing place. I was reminded by the various presenters, whether they were art therapists, music therapists, developmental pediatricians or Education staff from the Long Island Children’s Museum that I need to be an advocate for the kids. I need to create transcendent experiences for kids and for parents. I want all kids to have access to the same arts and music opportunities and experiences that I had as a kid. I believe that this is how I can contribute to the world. I also like seeing the parents be happy. That is the best. My mission is to make parents happier people. Parents should be considered allies. One art therapist spoke about how she involved a mother in painting a mural and how the breathing helped calm the mother down. I think that is wonderful. I love having the parents involved in our programs. Parents are artists, too. Even if they work in other fields, there are a lot of creative parents that should be involved in the work.